Splended day for the planet and all thereon! Lovely people, Anchor Groups all around in great collective alignment as the Master Cylinder grandly accepted and birthed those incoming injections of pure love of Lotus Heart energies. Thankyou for the occasion, for the gift. I just wanted to let you know the Chicago, Illinois group which began at 2:30 AM which is 9:30 AM Mallorca time and our event lasted until 6:30 AM. We did the Starry Processional, The Elements Dance, The Lotus Dance and the Earth-Star Dance and a few other things. 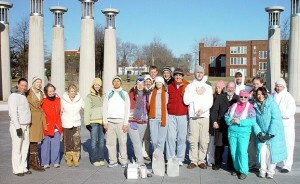 There were 24 in attendance, including 2 teens. Not bad for the last minute. People came out in the middle of the night and in zero weather!! Do you know what the date will be for the second part of the 8thGate? I hope to know about it way beforehand so I can have more time to prepare and get the word out. I would like to have 111 people next time and will need time to get a larger space and advertise the event. I am so proud of this Anchor Group that I had to write to you right away, even as I process the vast amounts on energy that continue to stream in. As I was driving yesterday, the mountains and trees and air itself were shimmering with this magnificent LOVE. I also feel we awakened this area to this work and predict there will be a large Anchor Group in the future. We were a small, but dedicated group of 9 who rehearsed in El Paso and held our Activation Ceremony in Mesilla, NM, thus bringing together two sister cities (El Paso and Las Cruces / Mesilla). 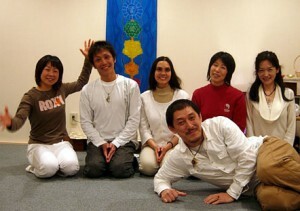 The members of our group included well-known spiritual teachers of this area and all 8 are magnificent Beings. We met early in the evening of the 10th, had one last practice session, and then slept for a couple of hours (not me! ), awakening in time in begin our work around 1 a.m., MST. 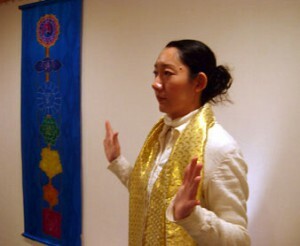 We begin by opening the One Heart and walking through the meditation garden (see photo). Steve and I made a gateway in the front, representing the 2nd Gate, The two becoming One, and participants exited the garden through Raoul and Lucy’s gateway, which represented 8th Gate as True Loves. 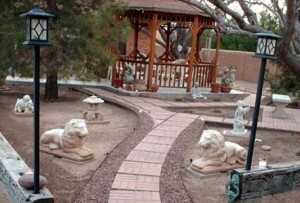 What was especially neat about this garden was that Two Golden Lions flanked the entrance! After that, we danced the Earth-Star Dance, which was very powerful for our group. A very large and energetic Earth Being danced with abandon in the center of our circle (which is how we ended up toward the end of the One Heart Waltz), and then he flew up and disappeared! I put on your video from the 11:11 Doorway Opening during the food break, and the group was watching with great interest, when I felt strong energies coming in. I stood up into Guardian position, then after a bit realized the energies were getting stronger. “Sorry to interrupt your break, but we need to dance NOW!” And we did the Insertion Point Dance. I know it is probably unusual for an Anchor Group to do it, but I feel so deeply moved by and connected to the music, I felt we simply HAD to do it. Originally, only Steve and I and Raoul were going to dance it, but at our practice session earlier, 3 other brave ones took on the Dance, too! We were struggling with fatigue by this point, but everyone kept going, and we completed the dance, then moved on to the Lotus Dance. I decided to be a Guardian and let the group be on its own. They were so united for this dance. It was a beautiful site to see the unfolding petals of the Lotus Flower. We did not get to do the Dance of the Elements, much as I wanted us to do it. We ended our Ceremony around 8 a.m. in the garden again, ending with a final Lotus Heart Circle. Carol, our lovely hostess, had asked us to bless the land that was to be made into a labyrinth, so after the completion of our Ceremony, we followed Raoul’s soulful drumming to the land, passing through two more Lions! So the Lions were present for us, too. I must confess that I so wanted to dance the Golden Lion Dance, so I look forward to being at a Master Cylinder (and bringing all three of us!) soon in order to be able to do so! I want to add that we had one small crisis early in the evening that gave our group a wonderful opportunity to bring forth Lotus Love. Steve was trying to put our son Zachary to sleep over in an area behind some screens, to noavail. He was becoming increasingly frustrated and stuck, and refused to leave Zachary, even though I knew Zachary would be fine and fall asleep when he was ready or join us. (He thought our white outfits were really great and he insisted on dressing in white as well, because, he said, we were dressed like Luke in Star Wars! ) Finally, in desperation, I had the group line up in twos and open the One Heart and we had Steve walk through our Lotus Love tunnel. By the time he reached the end, he looked so much better! He wasable to join the group (and Zach did indeed fall asleep-eventually!) We also had my dog, a Bichon Frise named Lexie, there, and she wasn’t settling down either, crying quite a bit. We think she was doing some work with us, because of the way she kept circling the perimeter of our circle, occasionally, yet quietly, entering. Steve said he could tell she was also watching many of the Beings who had joined our Ceremony. In the energy of love, song of my heart in musical note of enlightened pure love tune, thank you & light of love and joy blessing. I’m still in the ecstasy that beat inside of me, in every cell in my multi-dimensional being. Thank you for the call and reuniting the family to fulfill her highr service in the light of love and the enlightened divinity. We started with a prayer and meditation to connect with each other at 5 pm our time. This included reading the locations of the Anchor Groups around the world. We then proceeded with the dances. We did The Starry Processional, The Lotus Dance, The Dance of the Elements, and the Earth-Star Dance. About an hour into the dancing, there was a palpable shift in the energy and we felt the heaviness and heat just lift off of us. It was as if a cloud had passed. About an hour and a half into our dancing, I had an image pop into my head of a beautiful and very large column of pink sparkly light pouring down into Mother Earth. This energy bathed the women within the Earth (those who had died and been buried beneath Japan) with this pink light. They woke up from slumber, their faces and then their whole bodies lit with this pink light and they collectively raised their arms up to it as a shining heart formed and rose from the ground beneath them, surrounded by a large lotus flower, which bloomed around the heart. It was such a beautiful image that I lost a few tears over it. The energy remained strong well after we had stopped dancing and it took us some time to leave each other. Our group bonded in a very lovely way and we all agreed to do this again, with hugs all around. It was a very wonderful experience and I feel that we were very blessed today to be able to participate in the 8th Gate Activation.